With ASEAN touted to be at the frontline of the Internet of Things (IoT) soon, we at Asia IoT Business Platform continue to seek more learning points about IoT and how the region can leverage it to boost their economic competitiveness. It remains at the top of our minds that ASEAN is a market that is still developing; it is therefore important to look beyond the region for pointers that can be translated into actions. It is, after all, our mission to drive the adoption of IoT technologies in ASEAN. We had the pleasure of meeting Deon Newman, CMO and VP Marketing at IBM Watson Internet of Things, at the IBM office in Singapore. While it was a short session, his insights on the IoT landscape and the technology itself brought a new and fresh perspective on what we have already known for quite some time. 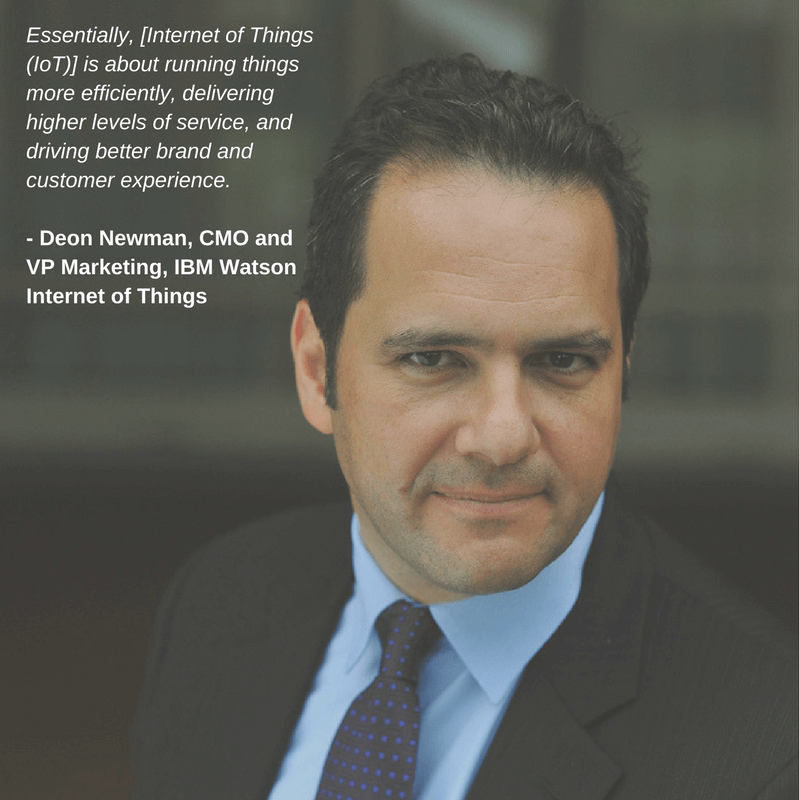 Bringing it back to basics and speaking on the purpose of IoT, Deon shared his excitement on the things that IoT technologies have already delivered to businesses and consumers alike, as well as the promising future of a connected world. Deon began by recognising that companies are rapidly moving towards adopting IoT technologies and that many are already on the path of digital transformation. This is largely driven by plans for growth and expansion, as well as the need to return to the their bottom-line. “Essentially, it is about running things more efficiently, delivering higher levels of service, and driving better brand and customer experience,” he said. What excites Deon the most though, are the conveniences that IoT technologies are bringing and how inanimate devices and objects are being ‘enchanted’. In many ways, IoT has not only connected remote devices and automated various processes, but these devices and items are also being given a life of their own. He brought up an example of a minibus, 3D printed by a small company in Arizona. Olli is an autonomous-driving minibus which can hit the road without requiring any driver. However, people are cautious of that very fact. “People don’t like being in a vehicle that has no steering wheels or brakes. It is pretty unnerving,” Deon said. For that reason, IBM Watson Speech to Text capability was integrated into the bus to give it a voice. Beyond automation, the bus can now communicate with passengers and actively seek to fulfil their needs in almost a human-level response. “It is really bringing a whole new level of brand expression and brand life, and I love that!” he said. Olli is just one of the examples; Deon also gave instances on how video and audio recognition have also altered processes and operations across different industries such as fleet management, to prevent breakages, leakages, and other costly incidents. Moving away from the wonders of IoT, we spoke with him about the IoT landscape in emerging regions such as ASEAN and the opportunities that lie in its different markets such as Indonesia, Malaysia, Thailand, and Philippines. Having worked to drive IoT adoption in the region in the past three years, not only have we found many opportunities, but we found market-specific challenges as well. Deon, however, is optimistic about the future of ASEAN in terms of the opportunities for IoT. Acknowledging the state of the markets being in the developing stages, he also highlighted that such emerging markets naturally have strong and dominant industries that can benefit from IoT. “There is a heavier orientation towards industries and sectors such as agriculture and manufacturing because certainly, they are more dominant in these markets,” he said. IoT devices can collect fundamental information about the climate, the ground, and other data to realise more accurate systems of management. The deployment of IoT technologies basically enables greater efficiency and productivity across verticals. Apart from using IoT and data for monitoring, Deon also highlighted smart buildings and smart cities as areas that have great opportunities for IoT in markets across Southeast Asia. In many ways, smart devices can increase safety and security and improve the comfort of a building’s occupants. Pragmatically, IoT technology can determine the extent of damage that buildings suffer after unforeseen events and help prevent structural failures. More importantly, however, Deon underscored how smart devices can help reduce energy consumption to drive energy efficiency and meet sustainability goals. This is especially critical after the signing of the Paris Agreement by nations all over the world. “Statistically, 43% of energy consumed in the world is by buildings and this is an area in which IoT technologies can be leveraged to make things run more efficiently to ensure sustainability in the long term,” he added. Smart city is by far the most promising for IoT technologies, especially in ASEAN. Due to high population density in many cities in the emerging markets, urban issues such as traffic gridlock, pollution, and flooding are rampant. However, these problems can be alleviated by deploying IoT technologies to tackle different elements within a city. Several cities in ASEAN are already exploring the use of IoT technologies to solve urban issues, and one of them is the Vietnamese seaport City of Da Nang. The city launched smarter water and transportation initiatives to improve the quality of life for citizens. Applying advanced smart technologies, the Da Nang government is able to address the significant water and transportation issues that are impacting city life. The solutions deployed by city government provide a summary of events and incidents through maps, dashboards, and alerts, allowing city personnel to track trends, forecast demands and better manage the city’s infrastructure and assets. For instance, Da Nang’s Smarter Water initiative saw the Da Nang Water Company (DAWACO) implementing a program of expansion and modernization at its treatment facility for real-time analysis and monitoring of the city’s water supply. Da Nang is also investing in its public transit network and expanding its new Bus Rapid Transit system to combat traffic congestion, on top of using advanced monitoring technologies to oversee traffic and to control the city’s traffic light system through a dashboard. City leaders across ASEAN are taking a strategic approach to building their own smart cities by starting with practical and focused areas such as water and transportation issues, as in the case of Da Nang. The city now has a long-term plan to become an environmentally and economically sustainable city and its leaders are planning to apply technology to transform other areas such as public safety, flood management, and food safety. Despite the apparent opportunities and the great potential in different sectors across the region, it is a known fact that IoT is a complex system; industry analysts cited complexity or ‘difficulty of integration’ as one of the top challenges of IoT, together with security (or the lack thereof). This has also manifested in our work across ASEAN where many end-user enterprises are worried about the difficulty of integrating IoT technology into their current systems and operations. It is therefore, of paramount importance for IoT solutions providers to create end-to-end solutions to minimize the difficulty of deploying IoT technology. In providing a one-stop solution, solutions providers should also not neglect the criticality of consultation and ongoing support for enterprises looking adopt IoT. Simplifying the process of integrating IoT technologies for end-users does not only highlight the delivery of better service and customer experience that Deon spoke about earlier; the aim of this is also to establish a good foundation that can catalyze the general rate of adoption and deployment of IoT technologies especially in emerging markets in ASEAN. Beyond the service front, Deon emphasizes the importance of a network infrastructure as a critical foundation in supporting any IoT implementation in the region. Bringing it back to the very basics once again, he concluded with an opinion on how to drive IoT growth and developments in Southeast Asia.